If you have never done this before, it can be really frustrating sometimes as the lobster has a pretty good advantage as he is much faster and more manuverable than you, but if you keep a calm head and can hold your breath well (when snorkling) you can get your limit if the lobsters are there. 1. you have LOTS of time to get ready if you do not bother the lobster before you start so don't PANIC. 4. When snorkling sometimes it is best to go at him upside down so that you can hold yourself down (flippers up) and in front of him more easily. 5. Try to slide the tip your stick behind him without touching him and then gently, but firmly touch his tail to make him walk out of the rock & toward you. Sometimes you may need to pull him out a bit and that is why I like the bent stick best. 6. Get the lobster clear of his shelter enough so that you can slide your dip net behind him without touching his antennae or his tail. 7. When you have the net behind him, tap his head with the stick to make him shoot back into the net. If you miss him, keep your head and set up again as you see in the video. 8. When in the net, pull the net toward you and push up to create a pocket where he will be trapped, but you must know that you must either shoot for the surface (when snorkling) or grab the lobster inside the pocket (as seen in the video) because the lobster is more than capable of escaping from this pocket if you do not contain him immediately. 9. Make sure you have a measuring device with you and measure your lobster before putting into your catch bag. I didn't measure this one as he was 3x the size required. 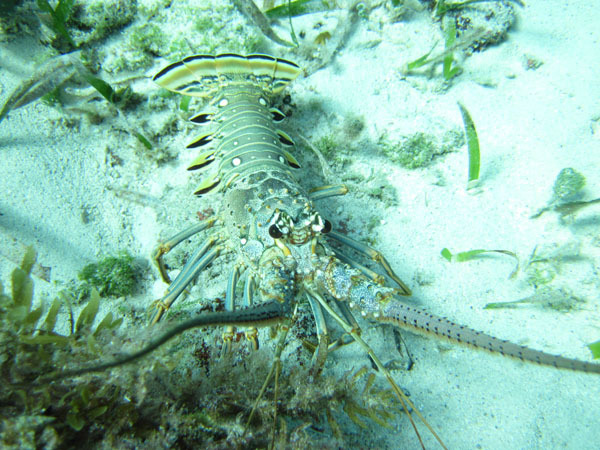 See how to catch Florida Spiny Lobster using a tickle stick and a net by clicking on the video below. Click HERE to find great ways to prepare your Florida Lobster.